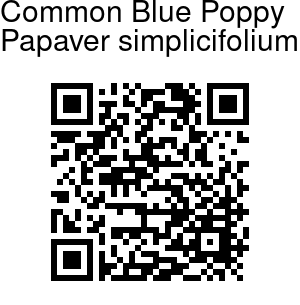 Common blue poppy is characterized by small, solitary flowers on leafless stems.This species was discovered around 1848. This species doesn't get as much attention as the other ones. The plant gets 20-50 cm tall in flower (up to 85 cm in fruit), basally with dense tuft of old leaf remains accompanied by rufous or golden barbellate bristles. Leaves are all basal, forming a rosette, deciduous. Leaf-stalks are linear, about 20 cm. Leaves are inverted-lanceshaped or lanceshaped to ovate-lanceshaped, 4.5-16 x 0.9-3.5 cm, midvein and lateral veins distinct on the underside., base attenuate into stalk, margin entire or irregularly serrate or crenate, tip pointed or blunt. Flowers solitary on scape, up to 5 per rosette, occasionally more. Flower buds are broadly ovoid. Sepals are densely hairy. 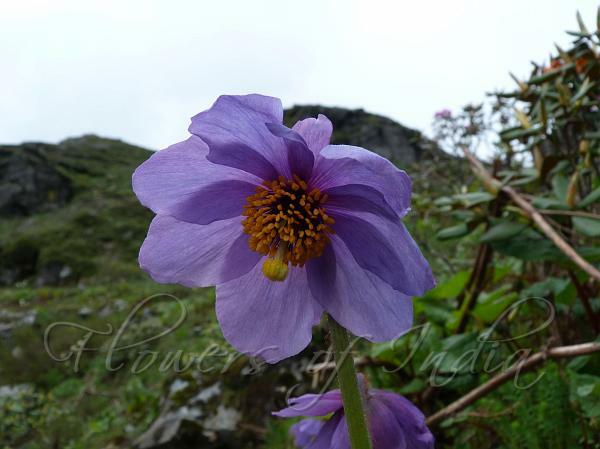 Petals are 5-8, purple to deep sky blue, obovate, 3.3-4.8 x 2.4-4.4 cm. Filaments are of same color as petals, threadlike,, 1-1.5 cm. Anthers are orange, golden, or yellow, oblong, about 2 mm. Ovary narrowly elliptic to oblong-elliptic, 1.5-2 cm, glabrous or setose; styles distinct, 4-9 mm; stigmas green, brownish, or whitish, capitate or subclavate, 4-9-lobed. Capsule is narrowly oblong to oblong-elliptic, 4.2-6.5 x 1.3-2.8 cm. Common Blue Poppy is found in the Eastern Himalayas, from Nepal to Bhutan, SE Tibet, Sikkim and Arunachal Pradesh, at altitudes of 3300-5300 m. Flowering: June-August. Photographed beyond Tsomogo Lake, Sikkim.